Cole, DuBoise, and Brue shared their stories in the first of a series of talks and networking events that focus on "incredible women at the top of their game." NEW YORK—In life and fitness, hard work and trusting the process are what matter, according to three New York fitness icons. Their businesses are market leaders, and their inspiring stories of self-made success were told at a cozy event geared toward aspirationals on Oct. 20 at the W Downtown Hotel. Success wasn’t quick and it wasn’t easy, according to Laurie Cole, founding instructor and partner of SoulCycle. “It was a slow build. We didn’t get paid at the beginning; I put IOU’s in the till to pay my rent,” she said. SoulCycle is now a household name, with 66 locations across the United States and two boutiques opening in Canada. To its inspirational instructors and those who attend its candlelit sessions, it’s more than a stationary bike class. SoulCycle is as much about what’s going on in the mind as the body. This helps explain Cole’s success in keeping motivated and breaking through the despair that can gather around any entrepreneur. It will always be a harder journey, but deeply satisfying. Danielle DuBoise started Sakara Life with long-time friend, co-founder Whitney Tingle and only $700 they raised by throwing a party and charging friends to come. Now their organic, plant-based meal delivery program is a multimillion-dollar company, and they have been named in Forbes’s 30 under 30, Mind Body Green’s 100 Women in Wellness, and Oprah’s SuperSoul 100. Looking back, she can see how each step took her toward her goal, but she had to stay intent on that path. “You don’t have to go join the pack, and you don’t have to fall off the wagon; you’re on the path when you’re on your journey,” said DuBoise. You don’t have to go join the pack, and you don’t have to fall off the wagon; you’re on the path when you’re on your journey. One step at a time was a theme of the night. In Alexia Brue’s case, it was one article at a time. She is the co-founder and publisher of Well+Good, a popular lifestyle and wellness publication that aims to inspire its readers to make healthy choices. It worked. Brue and her co-founder Melisse Gelula have appeared on ABC News, “CBS This Morning,” and in many publications. Like the strain of exercise, the intensity that comes from creating a business can also be healthy, she said. The series is called “What She Said.” Oct. 20 was the fitness and wellness edition, which included a second session that was more physical, with a two-hour-long marathon of workout classes. Half of all proceeds raised from both nights went to the Young Survival Coalition for young women recovering from breast cancer. 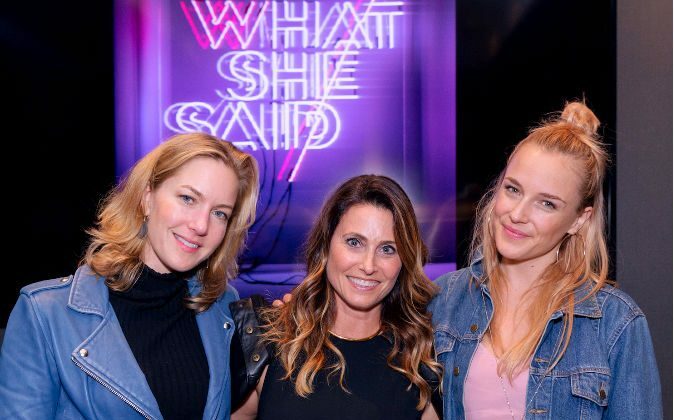 Future “What She Said” events will focus on fitness, fashion, music, and design. See www.whotelsnewyork.com/calendar for upcoming events.